A chrome-domed criminal will serve two years in prison for heading a Rogaine theft ring that targeted more than two dozen pharmacies in Ohio, according to court records. 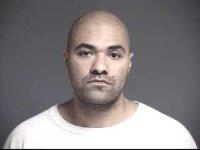 Andres Arias, 36, pleaded guilty Tuesday in Common Pleas Court in Warren County and was sentenced on a felony count. Arias, seen above, was named earlier this year in a 12-count indictment charging him with participating in an “organized retail theft ring” that victimized numerous CVS and Walgreens stores. As part of a plea deal, prosecutors dropped money laundering and theft raps in return for Arias’s plea to engaging in corrupt activity, the indictment’s top charge. According to investigators, Arias, a Florida resident, and several cohorts stole Rogaine and other over-the-counter drugs from the pharmacies and then shipped the products to a “retail fence” in New Jersey. “Some of the items would then appear online to be sold on eBay,” the indictment noted. The stolen Rogaine was not for the personal use of the bald Arias, who is now known as prisoner A730999 in Ohio’s Department of Rehabilitation & Correction. In addition to serving two years in custody, Arias has also been ordered to pay $22,000 in restitution. Is $34 Actually The Going Rate In Florida For That Service?